Garth Turner is going to try and enter Federal politics for a third term in the House of Commons, this time as a MP for the Dufferin-Caledon riding. The former MP announced this week that he has officially submitted his papers to seek the nomination, and that those papers have been accepted. Mr. Turner, 60, represented the riding of Halton-Peel from 1988 until 1993, having been elected as part of the second Progressive Conservative majority government of Brian Mulroney. He sought the leadership of the party in '93 when Mr. Mulroney stepped aside, gaining 76 first-ballot votes before dropping out of the race eventually won by Kim Campbell. Mr. Turner served as Minister of National Revenue in the short-lived Campbell government before losing his seat in the Tory debacle later that year. 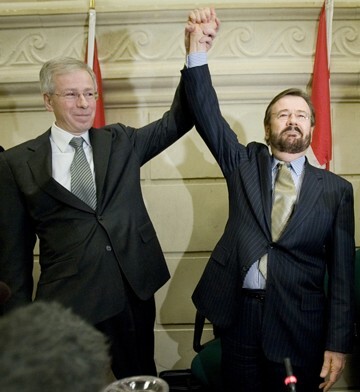 Garth Turner returned to Parliament representing Halton as a Conservative under Prime Minister Stephen Harper in the 2006 election, but soon found himself at odds with his leader and was kicked out from caucus later that year. He eventually joined the Liberals after briefly sitting as an independent, and was defeated in last year's federal election by Lisa Raitt, now federal Natural Resources Minister. Riding Association President Jeff May has also announced plans to seek the nomination. No date has been announced for the nomination, but Mr. Turner said he expects that will happen soon. David Tilson of the Conservative Party is the current sitting member in the Dufferin-Caledon riding. Tilson is expected to run again and is widely considered the favorite in the mostly conservative riding. Posted: August 20th, 2009 under News, Politics.